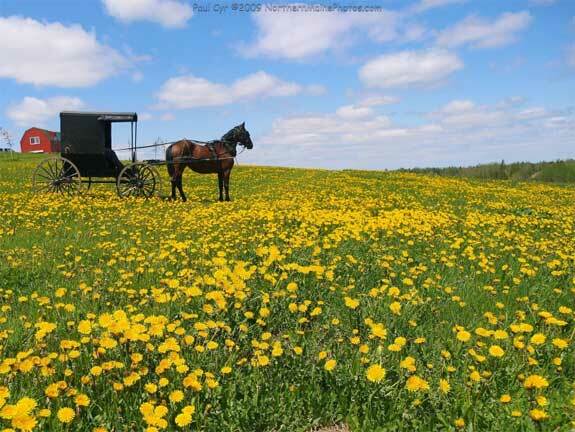 Amish farm in Maine's Aroostook County. Maine — named either in honor of Queen Henriette Maria, who owned the French province of Mayne, or to distinguish the mainland from its associated coastal islands — is less of an assimilative melting pot and more of a celebration of varied and distinctive cultures. Racially, the state is overwhelmingly – 95% – white, with Native American combined with others making up 3% of the population. Blacks and Hispanics each represent 1% of Maine residents. Residents of Maine – known as Mainers – are primarily comprised of Yankee stock as derived from Scots-Irish and English immigrants. French-Canadians comprise the largest minority group. As early as 1524, European explorers visited the area and later in 1604 attempted to establish a permanent settlement on an island in the St. Croix River. Immigration has continued into the state now for 600 years. In the 1990’s the Amish established a presence in agricultural areas. The most recent immigrants to the state in the last decade appear to be retirees due to the state’s beauty, economic health and multiple pastimes. They join an enormous cultural diversity that includes Acadians, African-Americans, Amish, Finnish, Franco-Americans, Irish, Jewish, Native American, Russian and Swedish peoples. The term Acadian refers to French-Canadians who had settled in eastern Canada for many decades, only to be expelled, deported and exiled after the French and Indian wars. Some were returned to France, many settled in present-day Maine and some continued further south to Louisiana and are now known as Cajuns. In Maine, the Acadians moved north to settle the St. John Valley in the state’s largest and northern-most region, Aroostook County. Their landing site, The St. David Cross, is one of many historic icons in the Madawaska Historic Center. The Center also operates the Tante Blanche Museum dedicated to an Acadian folk hero who fed thousands during the Great Depression or an earlier folk heroine, Marguerite Blanche Thibodeau Cyr who saved many from starvation during an historic famine of 1797. Other Acadian historic sites include a reconstructed historical town known as The Acadian Village, a museum in a former Catholic church, Le Musee et Centre Culturelle du Mont-Carmel, and an historical Blockhouse that dates from 1839. An annual multi-day festival that draws thousands of participants, The Acadian Festival, takes place in Madawaska. In 2014, the World Acadian Congress will take place from August 8th to 24th. Despite the small proportion of African-American residents in the state, Maine played a crucial role in the anti-slavery crusade’s Underground Railroad, particularly in the Portland area. The Portland Freedom Trail is a walking tour of 16 sites associated with the anti-slavery movement and includes The Abyssinian Church, constructed in 1827 and one of the three oldest Black churches still standing in the United States. The Mariner’s Church — site of the printing of the first Black history, Light and Truth — is also included on the tour. The Anabaptist old-order Amish are among the newest immigrants to Maine. They began purchasing farmland in the 1990’s and relocating to southern Aroostock County. In Smyrna, Easton, Unity, Waterville and other communities, they have continued the lifestyle they have maintained for centuries. The Pioneer Place General Store in Smyrna offers Amish-made goods produced with the same quality and workmanship for which this group is known. Finnish immigration to the United States began in earnest in the mid-1800’s to the early 1900’s due partially to anti-Finnish policies applied by the Russian government, who controlled the country at that time. Upon arriving in Maine, the Finns settled in the Mid-coast region as well as Oxford and Piscataquis counties. Towns they clustered in include Thomaston, Rockland and South Paris. Finnish immigrants established social groups and other organizations to ensure and enjoy the continuity of their culture. Sites available to explore Finnish heritage include The Finnish Heritage House in South Thomaston, The Finnish American Heritage Society and the Monson Historical Society. A Finnish music group, The Maine Kanteles, performs on occasion in the South Paris area. The Franco-American population of Maine includes the Acadians as well as later immigrants directly from France in the 19th century. Together, this group makes up the state’s largest minority population. French immigrants settled in towns dependent upon the fabric industry and textile mills, particularly along the Kennebec River. Augusta, Waterville, Lewiston and Auburn are overwhelmingly Franco-American. There are numerous cultural sites celebrating French heritage throughout the state, including some area Catholic Churches, The Franco American Heritage Center and the textile worker-based Museum L-A. Festivals abound, weekly and yearly, including the monthly Biddeford Art Walk. The Irish population in Portland was significant enough to build St. Dominic’s Church as early as 1828 and outgrow it in 1888. They also settled in a Maine Mid-coast town named Belfast as early as 1770. St. Dom’s later became the Irish Heritage Center in 1998 and is one of 58 sites along Portland’s Maine Irish Heritage Center. The Center sponsors significant cultural events, classes as well as an annual St. Patrick’s Day Parade. Although Jews settled in Maine as early as the Colonial days, the vast majority arrived during the 1800’s and early 1900’s. The cities with the largest communities include Portland, Bangor, Lewiston and Augusta. Cultural sites are numerous and significant. Documenting Maine Jewry, Portland’s annual Maine Jewish Film Festival and The Tree of Life Museum all serve both the Jewish and Gentile communities. In addition to the residential community, thousands upon thousands of Jewish children enjoyed summer camp experiences in Maine throughout the decades. Native American communities — People of the Dawn — predate all of Maine’s other ethnic groups. The state’s four tribes include Aroostook County’s Micmacs and the Maliseets, the Penobscots of Indian Island and the Passamaquoddy found near Eastport and Calais. In addition to annual pow-wows, there are three primary Native American cultural events in the state: Bar Harbor’s annual Native American Festival and Basketmakers Market each July, the Common Ground Country Fair held each September in Unity and the Maine Basketmakers Sale and Demonstration. Native American art and artifacts are found throughout almost all Maine museums. Those with the three greatest holdings include the Abbe Museum of Mount Desert Island, the Hudson Museum and the Maine State Museum. Maine has a significant Russian population. As late as the 1950’s, the town of Richmond (south of Augusta) housed the largest Russian-speaking community in the US. These immigrants arrived after the Second World War and established a community significant enough to support Russian restaurants, churches and cultural societies. Swedish immigration began with the US Homestead Act of 1862 that actively encouraged settlement of Aroostock County. Settlement took place primarily in towns named after their old homes: New Sweden and Stockholm. Other towns with significant Swedish populations included Woodland and Westmanland. The New Sweden Historical Museum is the primary repository of Swedish artifacts while the main celebration of all things Swedish is the annual MidSommar Festival.